Tamara Hersh, owner and pharmacist at Conroy Apothecary. 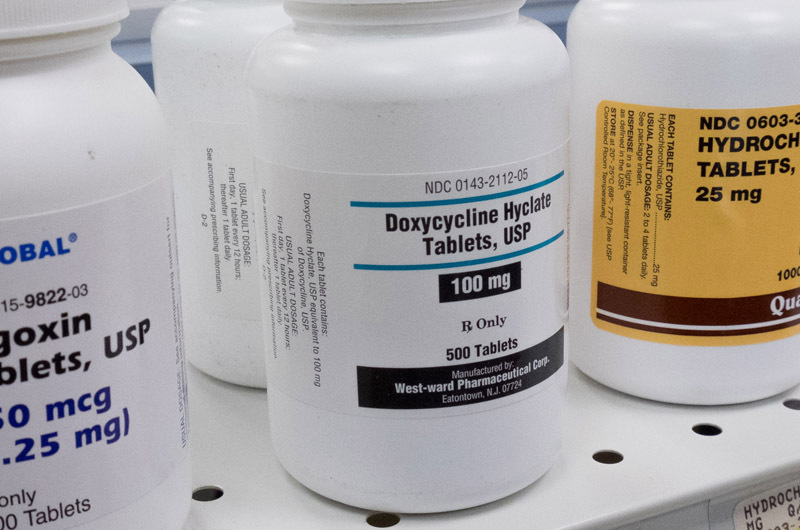 The cost of doxycycline, an antibiotic routinely prescribed for treatment of Lyme disease, has skyrocketed in recent months, causing consternation among Island medical and veterinary providers as well as health care consumers who foot the bills. 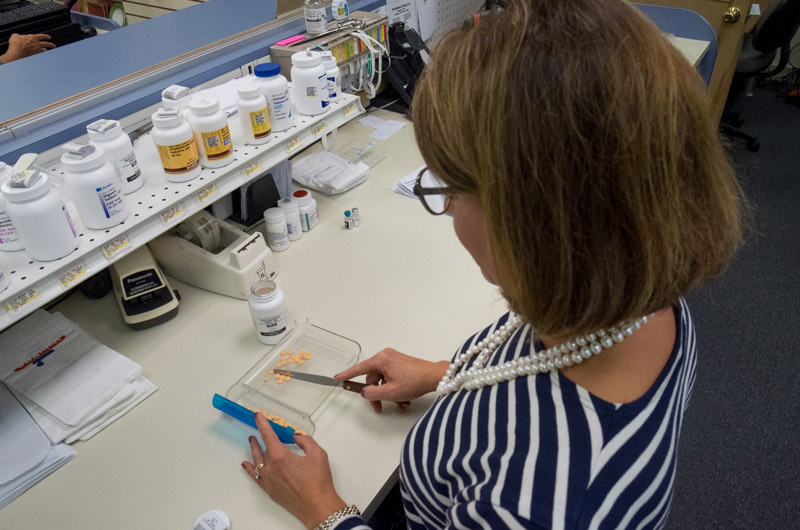 The retail price of doxycycline increased from about three cents per pill, to more than $5 per pill over the past 18 months, according to local doctors and pharmacists. The generic antibiotic is prescribed to some 1,500 patients on Martha’s Vineyard each year and is the first choice among doctors to treat most tick-borne illnesses. The dramatic cost increase has angered health care professionals and patients. In some cases, it caused doctors to change the way they treat their patients. While there are indications recently that the price may be coming down, there are only a few manufacturers producing the generic medication at this time. That leaves the Island vulnerable to future shortages and subject to the profit goals of a few companies that exert an outsized influence on the market for doxycycline. In late 2013, a three-week course of treatment (two 100-milligram tablets per day), cost $10 to $20 at Island pharmacies. By the summer of last year, that prescription cost $210 to $250, and remains at that level according to those familiar with the local market. Even those covered by prescription insurance were hit by price hikes, as insurers reclassified the drug to a higher cost tier and charged higher co-pays. According to a U.S. House committee investigating price hikes in several generic drugs, the average wholesale price of 500 tablets in October 2013 was $20. Seven months later, the average wholesale price for the same amount was $1,849, an increase of more than 8,000 per cent. According to industry experts, doxycycline is the subject of an unintended effect of legislation that created the generic drug industry. When a drug company develops a safe and effective medication, the Food and Drug Administration grants approval. The drug is patented, and the company has the exclusive right to sell the medication for 20 years, to recover the cost of innovation and development, and make a profit. When the patent expires, other companies can enter the market, making exact copies of the brand-name drug that are tested and proved equally effective, usually at a lower cost. The FDA estimates generic drugs save consumers $8 billion to $10 billion each year. Doxycyline is a well-established medication, the first choice for most doctors treating Lyme disease as well as other bacterial infections. It is safe, effective and inexpensive to manufacture. Once more than 20 companies made the generic drug. That created fierce competition. Now there are only three or four manufacturers. Over the years many companies dropped out of the market to focus on more profitable drugs. A wave of pharmaceutical mergers has also changed the economic landscape. Shortages can be caused by any number of unforeseen circumstances. Regulatory action can force companies to temporarily stop production of drugs. Raw materials are subject to their own shortages and price increases. In one case, damage from Hurricane Sandy forced a manufacturer to stop making doxycycline. The supply side of the supply-and-demand equation contracted quickly in recent years. That created what economists call a market failure. Instead of fostering competition that benefits consumers, the market created a situation where shortages, or profit motives, can overcome competition and spark extreme price increases. David Caron, director of pharmacy at the Martha’s Vineyard Hospital, stopped short of labeling the recent astronomical cost increases price gouging. In the spring of 2014, pharmacists began to experience a shortage of doxycycline from wholesalers. When they could get the drug, local pharmacists tried to stockpile supplies, and managed to keep enough doxycycline in stock. The dramatic price increase also affected the treatment of animals on the Island. 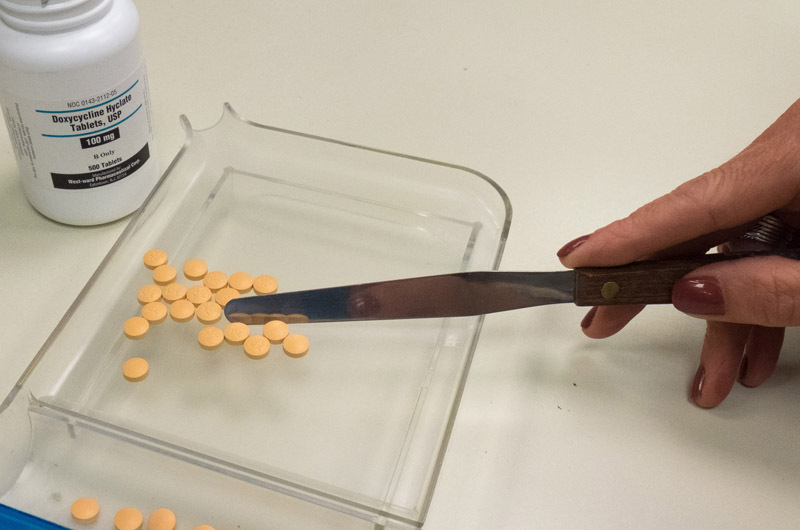 Dr. David Tuminaro, who treats all kinds of animals in his mobile veterinary practice Caring for Animals, said the cost of doxycycline sometimes prompted him to prescribe alternative medications. “It did change some of our thought process,” the veterinarian said. Before the price hikes, he would sometimes prescribe a one-week trial dose of doxycycline for a dog that had previously tested positive for Lyme disease, but he stopped the practice because of the expense. The cost issues were far more acute in large animals, especially because most animal owners do not have prescription drug insurance and must pay full retail price. Dr. Tuminaro said in one case, a client took a horse diagnosed with Lyme disease off-Island to be hospitalized for intravenous treatment with an alternative antibiotic. The cost of five days of treatment in an equine hospital was less expensive than a three-week course of doxycycline tablets. Still, he was reluctant call it price gouging. Joshua Cohen, director of the Tufts Center for the Study of Drug Development, and an authority on health economics, said the market for generic drugs often works well to benefit consumers, but when it doesn’t, it creates a chain effect throughout the health care system. At the end of that chain are sicker patients. The federal government has limited authority to step into private markets, even when they fail. Except in the case of drugs that are needed by active troops, or in some cases Veterans Administration patients, it is rare that government intervenes to make sure supplies are adequate. Federal authorities do have some ability to make distribution of drugs more efficient. The same thing has happened to narcan. Cycloserine. Daraprim. The list goes on and on and on. Don't be reluctant. Call it what it is. Price gouging. Greedy, manipulative, unnecessary, amoral, taking-advantage, pricing. The health system, and patients, are being blatantly ripped off, and it's worse every year. Enough is enough. Call it what it is. Price gouging. Right on Thomas! Gouging it is! Meanwhile Congress sits idly by reaching deeper into the pockets of Big Pharma and letting this industry rack up bigger and bigger, obscene profits. Stephen Brill, author of several articles about the financial excesses of America's health system, knows whta's going on and needs to be heard by those in power, our President included. I could not agree more wholeheartedly. Unfortunately the only presidential candidate to address drug price gouging has been Hillary Clinton. I somehow managed to hear that among the (at least to me irrelevant) 24/7 email stories. @Chip ... It's absolutely NOT true that Hillary is the only presidential candidate to address drug price gouging. Bernie Sanders was decrying this and trying to do something about it long before Hillary got on board. Moreover, because Sanders has such a lengthy history of fighting for the poor and middle class, he, not Hillary, is the only one I trust to actually DO anything about this problem. Bernie is running for the Democratic presidential nomination. For those wishing to vote for him, please be sure you're properly registered to vote in your state's Democratic primary. #FeeltheBern! Steve G is 100% correct that Bernie Sanders was speaking out against drug price gouging long before Hillary Clinton got on board. In fact, he has been strong on this issue for years even before running for president. For me this isn't a presidential issue. I'm sure there are plenty of places for that. Drug company exploitation should be an activism issue. We all sit here guilty, myself included. Tapping away at our keyboards...meanwhile while people may die. I'm not sure what i'm going to do about it yet...but at a minimum I'm gonna start by talking about this situation to everyone I know. Yes, call it what it is...gouging, greed, thievery. What matters most, however, is what we do about it. Fall voting seasons are approaching, this year and next...and every year after. Support the candidates who take no money or perks from K Street lobbyists...from any industry or corporations. Pharmaceutical, oil & gas, military contractors, environmentally hazardous chemicals....the list goes on and on. Until we throw the greedy out of Washington, DC, bills that regulate and protect the consumer and citizenry (and the life of this planet) will rarely make it to the floor for consideration, and if they do, they will be so watered down as to be totally worthless. Use that voting booth wisely. Make a difference. And that 401K and investment profile of yours? Take a good look at the corporations you're supporting. And make a change to socially conscious investments. Can it also be SUPPLY & DEMAND as stated in the article? The only price gouging is with the GAS STATIONS. If you're the only supplier, it doesn't matter what the demand is. You just charge whatever you feel like. Gas prices, and gas markups, are strictly bush league, compared to pharmaceutical price gouging. If the pharmaceutical industry set gas prices, you'd be paying $50-200 per gallon. Over the years I've had Lyme disease over 3 times. The first 2 times I had the classic bulls eye around the bites and was treated, I thought, successfully with doxycycline. But then.......a year later it returned (sharp pain in joints,e.g., knuckles and knees) so I would take a week course of doxycycline, and the symptoms would disappear for a week, but then return. I had a huge bottle of doxycyline and was doing this insane regimen for 6 months (week on, week off.) I finally went to Dr. Sam Donta (infectious disease specialist) in Falmouth and he put me on a strong regimen of tetracycline for 2 or 3 weeks, and I haven't had any symptoms for almost 25 years. I don't know how much tetracycline costs these days, but it might be a more effective option. There's more than one way to skin a tick. Good Luck! I would say the doxy you took week on week off for 6 months helped. Then the bugs were bombarded with tetracycline. It all helped. I am so very glad you have gone 25 years without any symptoms returning. Just to add to the list of medications. Good old burn cream, silver sulfadiazine, went from about $7 for 400g to almost $70 dollars. My insurance used to pay for all my medications. Now it won't pay for blood thinner (docs have a fit when I substitute nattokinase, but they don't have to pay the bill, and I feel better anyway), usodiol, armour thyroid (price gone up 4 or 5 times). My insurance only pays for Halcion now. But we are forced to take Part D, or there is a penalty. Part D, all of it is just another tax. We took medicare that is supposed to pay 100%. Now if we have any procedures the hospital sends us a bill, even thought we didn't know what or how much they were going to charge us. I have so far refused to pay. The hospital says, the government, medicare told them it was OK to bill us, even though up until this year everything in the hospital, procedure, operation, whatever, was totally paid for. I am incensed about this. Dirty pool is going on. Pretty soon asprin will be $50 a bottle. Permit more companies to be able to make drugs, and the price will drop real quick. We need some real competition. Don't let them holler patent. I have even seen natural substances (grown in the ground, or in the sea) patented. Patents should expire in a reasonable amount of time, and natural substances should never be patented. CRIME!!! against humanity. If you want criminals like Hillary Clinton and her ilk then you deserve what you vote in. Personally, I think most of them are criminals!!! I had my Lyme treatment jerked by criminal establishment medicine in 2008, so you can imagine what I go through daily. For the past two years I've paid out of my own pocket 150 a month and I'm totally disabled and on medcare. I live on a fix income . I written congressman and senator's and no help.I have more issuses now and can't even afford the doctor's..
We shouldn't have to depend on a candidate with only the possibility of becoming president to take care of price gouging! There IS a sitting president. Make him do his job and let him take care of it!! The Committee of Health and Human Services needs to address this problem by writing new legislation. These stealth infections have reached epidemic proportions and the government needs to treat this as an active epidemic just as if there were an outbreak of swine flu or malaria here in the US. It seems to me that emergency funds could be set aside for those who can't afford the treatment they need. I have been writing HHS for awhile now because of Medicare Part D's private contractors' refusal to cover a protocol I've needed and had to go without for the past 10 years. I urge everybody here who needs these types of drugs to inundate them with letters. Because I went so long without the treatment I need I'm now suffering neuro damage that is most likely irreversible. I'm sure I'm not the only one. Time to get militant everyone! Hasnt the infamous Obamacare kicked in yet or are the computers still down? I thought everybody was suppose to get all kinds of medical care on the cheep or free? I knew it was all just another scam! Others in the medical community have not minced their words: "Dr Alan Taege, a toxoplasmosis specialist at the Cleveland Clinic in Ohio, a major academic and medical treatment center, told the Guardian that he found Shkreli and Turing Pharmaceuticals’ approach “repulsive”." They have did this to Plaquenil. It went from $125 for a 3 months supply to $400. Due to a "shortagw". Considering there are no barriers to entry in the doxy market for pharmaceutical firms and there's more than one supplier, how can you be so sure this is price gouging. How do you know that these extreme prices aren't due to a shortage in supply? What concrete evidence do you have? And let's keep our sources scholary please. These price increases seem to be closely related to the supply of the doxycycline, which would also explain the recent and modest decrease in prices. As a drug becomes more profitbe, more firms will enter the market and compete thus lowering the cost to consumers. I also believe that demand is also playing a small but possibly significant role, atleast regionally, as we are heading into winter we won't have the same number of Lyme desease cases, thus lowering demand and prices. I do believe price gouging can and does occur, but we shouldn't be so reckless as to run around shouting foul when there is no evidence to prove it. When Big Pharma places a higher priority on earnings rather than treatment, everyone loses. Its been cited for years that newer antibiotics haven't been developed because it is perceived that the demand would be episodic in comparison to a long term drug regiment which boosts earnings. Seems like wealth is triumphing over health. Those who think this is a matter of supply and demand -- I'd ask "who controls the supply?" Answer: The same pharmaceutical companies who stand to benefit from a shortage. This is a distinction without a difference. If they were not price gouging they would make an adequate supply to meet the demand. I'm concerned because of a long history with Lyme Disease. Antibiotics don't cure mine but they help control and manage it. Price gouging: It does seem shameful that Island veterinarians are not able to call a spade a spade. It's a tough phrase for real medical professionals to utter as well, unless they have nothing to lose – except for some, their integrity as healers. Will be voting on bill to cover Lyme protocal next Tues. in Ma. This reflects the market demand and was predictable. The manufacturer will get richer for a short while only to succumb to the ravishes of the consequences of the very illness he/she exploited. Any advantage gained by exploitation of suffering ends up annihilated by the laws of thermodynamics. Those define our world. Took physics in Middle School?